What Is a WLMP File? A file with the WLMP file extension is a Windows Live Movie Maker Project file created by Microsoft's Windows Movie Maker program (older versions are called Windows Live Movie Maker). WLMP files store all the project related material that Windows Movie Maker might need to store, but it does not store all the actual media files. A WLMP file might contain effects, music, and transitions that pertain to the slideshow or movie but it only references the videos and photos. Older versions of Windows Live Movie Maker use the .MSWMM file extension for project files. WLMP files are created by and opened with Windows Live Movie Maker, which is a part of the Windows Live Essentials suite. This program suite was later replaced by Windows Essentials, thus changing the name of the video program to Windows Movie Maker. However, Windows Essentials has been discontinued and hasn't been available from Microsoft's website since January, 2017. You can, however, still download Windows Essentials 2012 from MajorGeeks and other sites; it includes Windows Movie Maker as part of a larger suite of applications. It will work with Windows Vista up through Windows 10. Be sure to choose a custom install if you don't want to install the other components of Windows Essentials. If you have an older version of Windows Movie Maker that only accepts MSWMM files, just download the updated version through the link above. The last version of Windows Movie Maker can open both WLMP and MSWMM files. 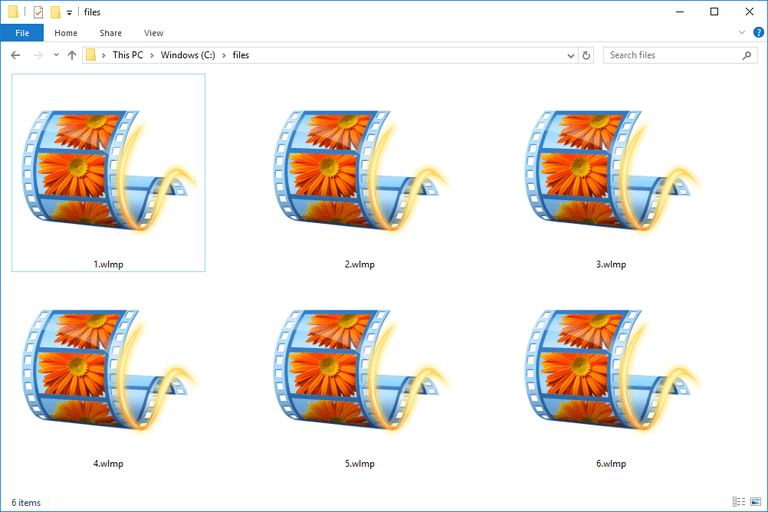 With Windows Movie Maker, you can export the project's video to WMV or MP4 from the File > Save movie menu. Use the File > Publish movie menu if you need to publish the video straight to Flickr, YouTube, Facebook, OneDrive, etc. If you know what device it is that you want to ultimately use the WLMP file on, you can choose it from the Save movie menu so that Movie Maker will automatically set up the export settings to make a video that will fit that device. For example, pick Apple iPhone, Android (1080p), or something else if you know that your video will be used on that device specifically. Once your Windows Movie Maker project has been converted to MP4 or WMV, you can put the file through another video file converter tool to save it to some other video format like MOV or AVI. Through that link are both offline and online video file converters that both support a wide range of export formats. Some video converters like Freemake Video Converter even let you burn the video directly to a disc or an ISO file. The first thing you should check for if you can't open the file is to see if it really ends with the "WLMP" suffix. Some files extensions just look similar even though they have nothing in common and cannot open with the same programs. For example, WML files that are Wireless Markup Language files, use a file extension that looks really similar to WLMP but they cannot open with Windows Movie Maker. On the same note, WLMP files will not work with a WML file opener. Another example is the Windows Media Photo file format that has the WMP extension appended to the end of its files. This kind of file opens with image viewers, including the Photo Gallery program that's part of Windows Essentials. It doesn't, however, open the exact same way as WLMP files. LMP is one last example of a file extension that's awfully similar in spelling to WLMP files. If you actually have an LMP file, it's a Quake Engine Lump file that's used with games developed within the context of the Quake game engines. As you can tell, you should be aware of the suffix that your file has because that's the easiest way to tell what format the file is in. If you don't have a WLMP file, research the file extension that you do have so that you can find which programs open, edit, or convert it.